Waaaay back in December 2017, Bo and I took a trip to Venice as a Christmas gift to ourselves. 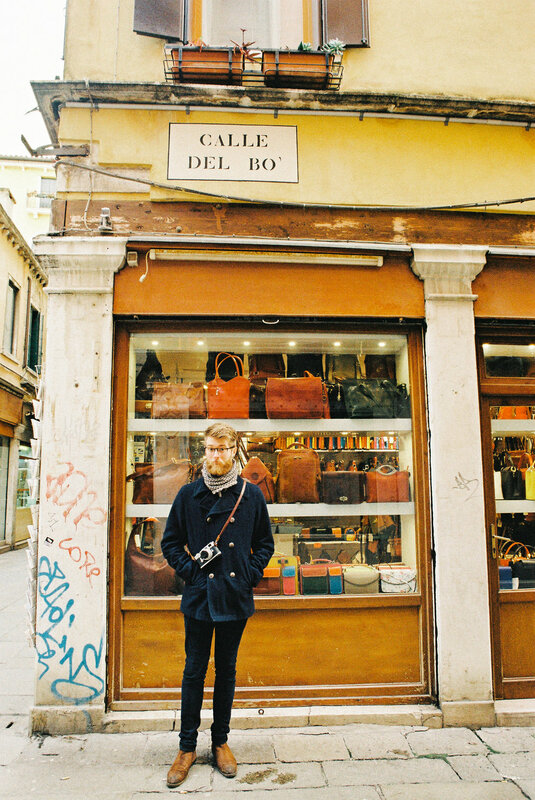 Bo had never been and it had been four years since I lived in Italy and visited Venice with friends. I had a lot to remember and only a week to show Bo as much of the city as I could. Throughout our week, we managed to cover a significant portion of the city and take in all that we could. As a challenge, I tried to think about and record some tips and tricks for my friends who would be coming to Venice a few months later. This post is a compilation of what I could think of along with some of my film photographs from the trip. Bo will post his own take on the trip soon, but that will take a more aesthetic approach. 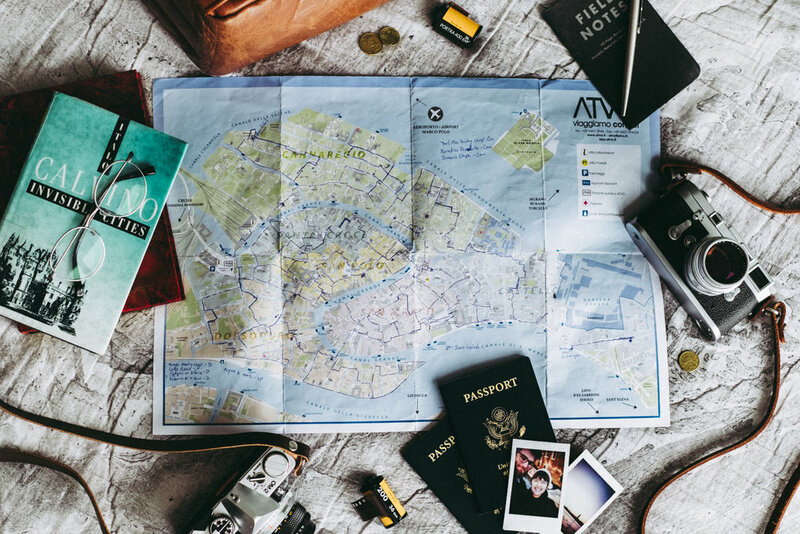 Buy/use a paper map of the city. If you mark all the streets you walk down, you’ll have a fantastic (free!) memento of your trip and you can re-live your days looking at the map. I starred and circled specific places on our map, like our places to eat (see below) and unusual happenings like when we made friends with the Norwegian Forest cat in Cannaregio. It’s very easy to walk a large portion of the city and each district (called a sestiere) has its own vibe and lifestyle to it. If you can’t get a map (which would be weird, they’re accessible at most vaporetto stops and the bus/train station as well as most tourist gift shops), you can use google maps app, but make sure you put in the district name where you want to go because a lot of street names are in multiple districts. Get on a boat. 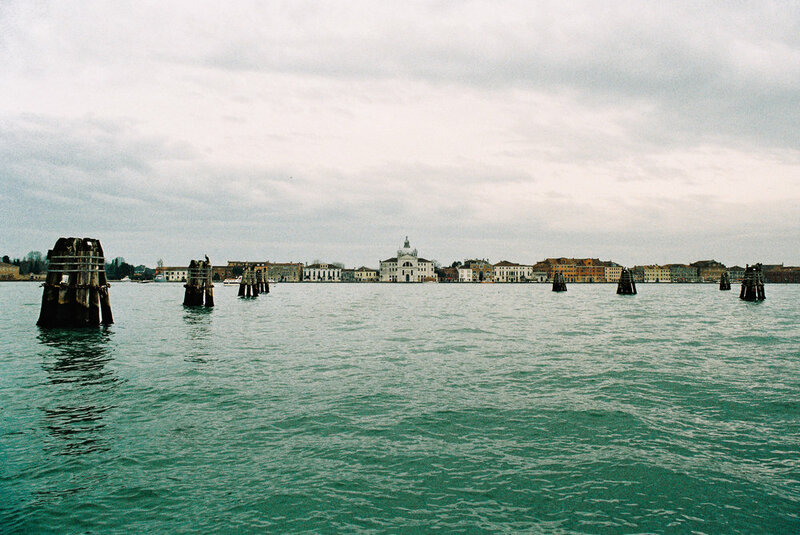 Whether it’s a gondola, traghetto, or vaporetto, Venice is different from the water and it’s worth seeing it that way. Each of them has their own feel and can be worth doing. 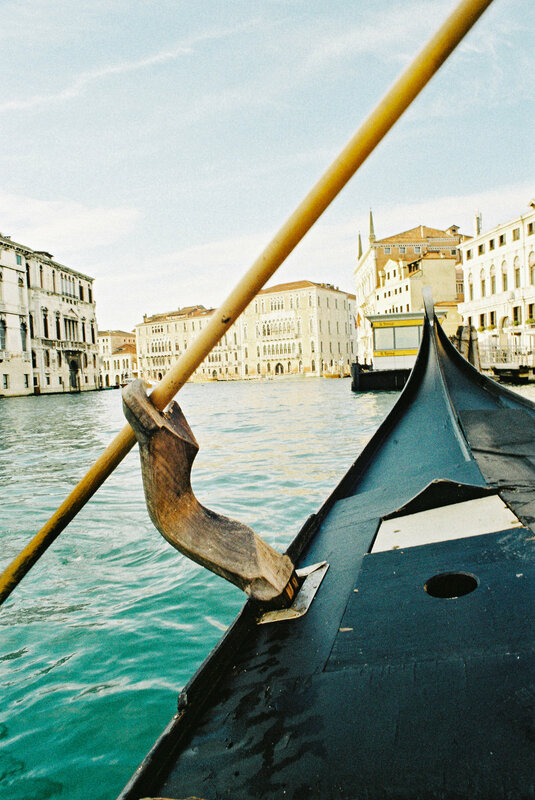 Gondolas are priced by the city, so no matter where you go, they will always cost the same. When we went in December 2017 they were €80 for a 45 ride. If you want to split the cost with another family, then obviously it will be less, but a bit less “romantic”. They don’t all sing or play accordion, but you can ask for it (it may cost extra). If you want something unusual, ask the gondolier to take you through some of the quieter canals and away from the Grande Canal, but make sure you go under one of the main bridges (Sighs, Accademia, or Rialto). Traghettos are gondolas that cross the Grande Canal instead of flow with it. For €2 you can hop on one instead of walking through half the city to cross a bridge. They’re used by locals and while the trip is short, it’s worth the unusual view and convenience. Vaporettos are just water buses/taxi. Very Important: Not all gelato is created equal. 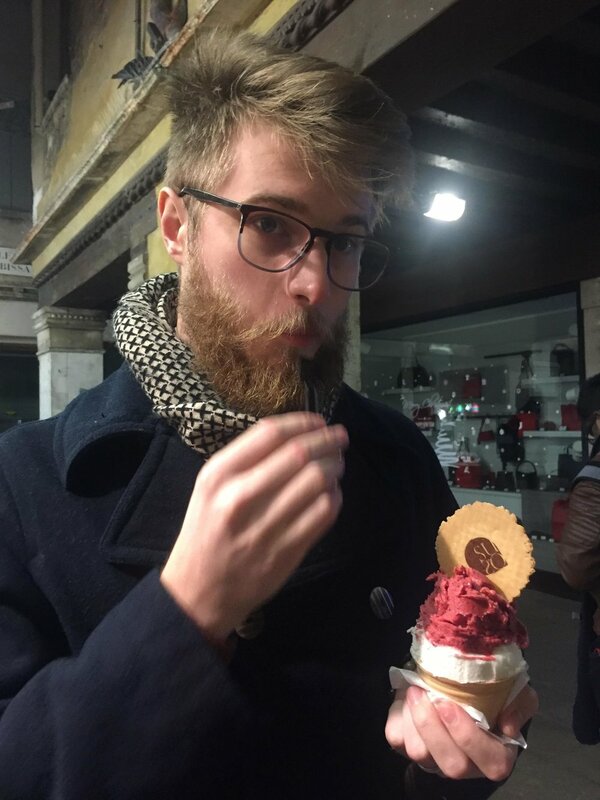 The best gelato is not fluffed up in the shop windows. The best spot is SUSO in San Marco. For a few € you get 2 bigs scoops of whatever flavours with cream and a wafer cookie. It’s hard to find because it’s tucked away off a side street, but worth looking for. Try an Aperol Spritz and a Bellini, two classic Venetian drinks. An Aperol spritz is a tangy martini-like drink with an orange color and a Bellini is Prosecco with peach juice. Both are fantastic with cicchetti. You can get a small bottle of Bellini in a lot of shops (try not to pay much more than €3,50 for a small bottle, the shops near the Rialto will charge over €5 for a tiny bottle). And almost any house wine in a restaurant is going to be good. 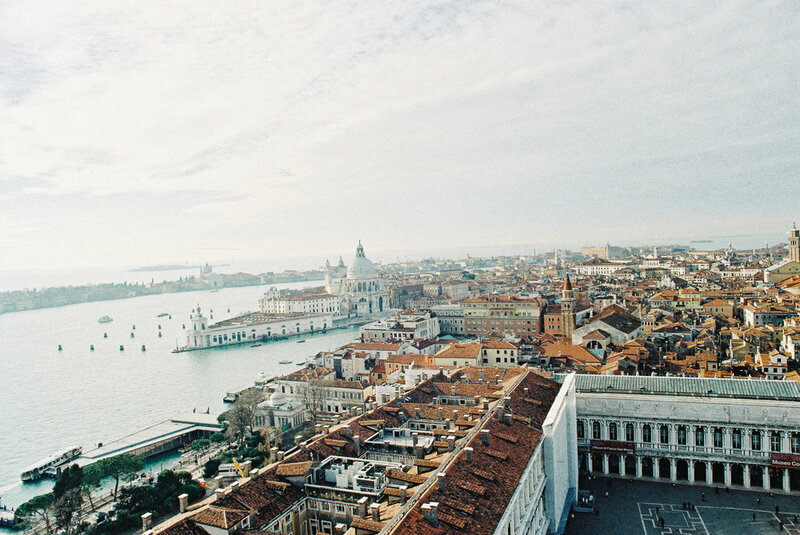 Watch the sunset from Castello facing the lagoon and San Giorgio. It’s a wonderful, peaceful view if you walk far enough along the lagoon away from San Marco. If you’re flying from Treviso airport (not Marco Polo airport), prebook the ATVO shuttle from the airport to Venice proper. It saves you so much time and hassle trying to find a way to the islands. They stamp your printed receipt and 45 minutes later you’ve passed Mestre, crossed part of the lagoon, and stopped at the bus stop on Cannaregio. From there you can get a vaporetto anywhere along the canal or walk to your flat. Venice is not stroller or rolling bag friendly. The entire city is walkable, but there are bridges and steps everywhere. With large crowds you will be uncomfortably in the way if you’re trying to gently manoeuvre your pram or stroller around. Venice isn’t the easiest place for toddlers and infant children in general. There are so few places to sit beside restaurants, so if you find a bench, take a break! You don’t know where the next one will be. Usually, they are in Campos or Piazzas or other more open sections of town. Also, there are so few public restrooms. Like 7 or something ridiculous. They charge €1,50 per trip so it can add up quickly if you have a lot of family members. You must have change! If you have a €2 coin, sometimes the attendant will be nice enough to make change for you, but the entrance is gated with a coin slot, so you’ll need a €1 coin and a 50 euro¢ coin. Irritating, I know. Granted they are some of the nicest public restrooms I’ve seen, but they aren’t always open on Sundays. If you can, find museums or at least 1 sit-down restaurant so you all can use the toilets. Street food is a lifesaver: grab a Tramezzino (triangle sandwich with no crust! ), a pizzette (pizza pocket) or a calzone. A Venetian classic is Gamberi Fritti (fried shrimp and calamari) or Pesce Fritti (fried fish on a stick). Easy food to walk with especially because there are so few places to sit. Avoid San Marco district for food and gifts (unless you are independently wealthy). It’s crazy. Easily a couple could spend over €100 on a lunch. No reason to do that. You can get to pretty much any other district from San Marco so pick a direction and walk until you find something cheap(er) and quieter. And don't go for pizza. 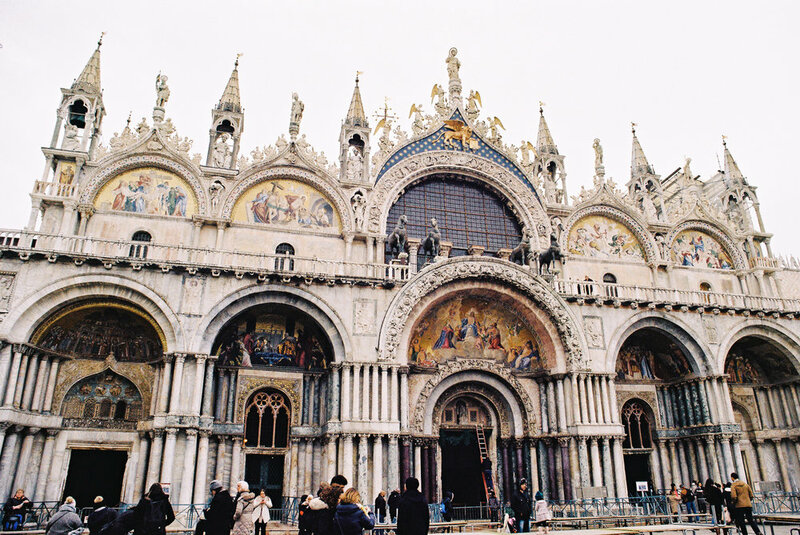 It’s not Venetian, it’s from the south of Italy and it’s not really worth your time and money. There are so many other options for great food in Venice. Speaking of food. Don’t expect much to be open (except tourist traps) on Sundays. The only time we didn’t enjoy our dinner was on a Sunday night when we had lost track of time and just popped into a random, cheap(er) osteria. If you can, plan to cook in on Sundays like the locals. If you have to eat out, read reviews online and pick a place ahead of time, even make a reservation if you can. If you want to get through the city quickly, get on a vaporetto (water taxi). They go the length of the Grande Canale and back again as well as out and around the islands. €7 gets you 1 ride from any point to any point, but if you think you’ll use the vaporetto more than 2x in one day, get the passes (24, 48, or 72 hour). 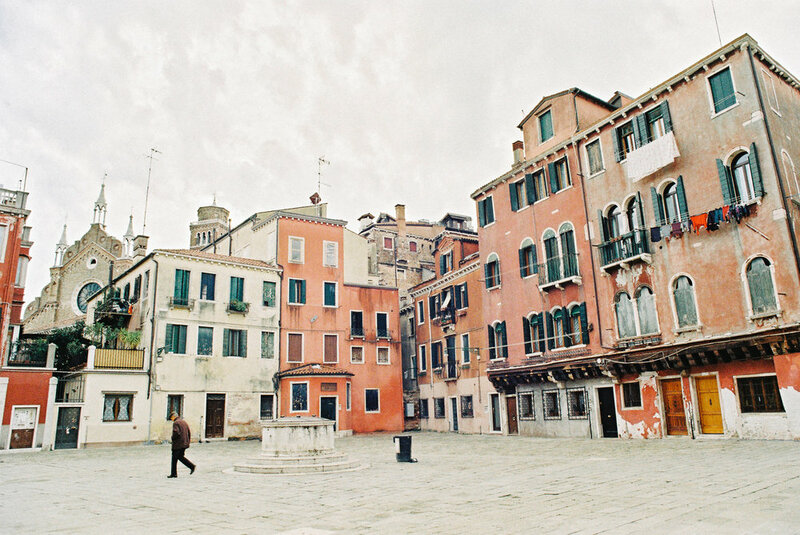 Venice is different from the water and you have to experience it one way or another. Especially if you are traveling with a lot of kids, the vaporetto might be a lifesaver when you really just have to get home or wherever you are going. If you are getting a late flight home out of Treviso, make sure you all eat before you get to the airport/through security. It’s a tiny airport with like 2 stands for food (pizza or sandwiches) and it’s beyond stupid expensive. Chapstick! It was bitterly windy and cold in December. Chapstick was hard to find (but maybe I didn’t look hard enough), and the one time I found it, it was €7 for a tiny tube. WHAT! A plastic bag for rubbish. Off the touristy areas, there are only a handful of public rubbish bins scattered about. Venice has a really strict rubbish policy for recycling, waste, and composting for their residents (which somehow doesn’t extend to the tourists). It’s nicer to have free hands when walking so much instead of carrying trash from lunch. Hand-sanitizer. It’s not an overtly dirty city, but it is still a dirty city with lots of travelers. We both came home feeling a bit under the weather. I’m sure it was from being in busy areas like the bridges and coming into contact with anyone and everyone. My Italian phrasebook. I lived in Italy and took a semester of Italian, four years ago (!!) and I had a hard time getting back into the routine of speaking. If I had had my little book of common phrases, I would have been much more comfortable right away. Some of the small (and very worthwhile) restaurants don’t have English menus and even though most people speak English, it’s still nice to at least try to speak common phrases in Italian. For breakfast, you must try a Hot Chocolate or Cappucino at Tonolo cafe in San Polo. One of the best bakeries in Venice, it’s on a corner with huge glass windows filled with sweet pastries - you can’t miss it. Order at the counter, and drink the bubbling hot sweet lava from beautiful blue and white china. Any dolce (sweet pastry) is a good choice there, including the soft flaky cannoli (not bubbled, crunchy like the Sicilian cannoli most Americans know). For €5 Bo and I heartily enjoyed our sugar-based breakfast. Interesting note: Cappucino is named for the “cap” of frothed milk on the top of the coffee and is the same name as the “capped” monks of the Cappucine monasteries in Italy who wear habits with heavy hoods. For lunch you must try a Gamberi Fritti from Acqua e Mais right around the corner from the Rialto Bridge. Venetian street food at its finest: A wooden cone with skewered calamari and shrimp that have been deep fried in polenta. So good and well worth the €5 per cone. The polpette are great too: deep fried breaded balls of seafood, chicken or fish. There really isn’t a good place to sit near the window, but if you walk towards Piazza Roma, there are a few open campos where you can rest. Other options are tramezzini from any cafe or stop into any osteria for a cicchetti (Chi- ket-tee), the Venetian form of tapas. A plethora of options for savory bits on toasted wedges of bread. scraps. They have their own full bowl of seafood scraps behind the bar. The menu is one page in Italian, and I’m sure it changes based on the season. Bo ordered a tagliatelle di mare (pasta of the sea) which was full of langoustine, mussels, clams, shrimp, and a rich red sauce. I ordered spaghetti nero di seppia (squid ink pasta with squid pieces). Both were to die for and substantially portioned. We could hardly finish our plates. It was our most expensive meal, but well worth it. €20 per person by the time you add drinks and a dessert. For something unusual, order the caico e pepe: cheese and peper pasta. It’s a Roman dish and because it’s not Venetian, the waiters kind of roll their eyes when a someone orders it. The display makes the entire restaurant turn to watch the chef make it right at the table, the stringy cheese spinning and twisting onto a plate. Also, the majority of restaurants include gratuity in their prices, so no tipping! 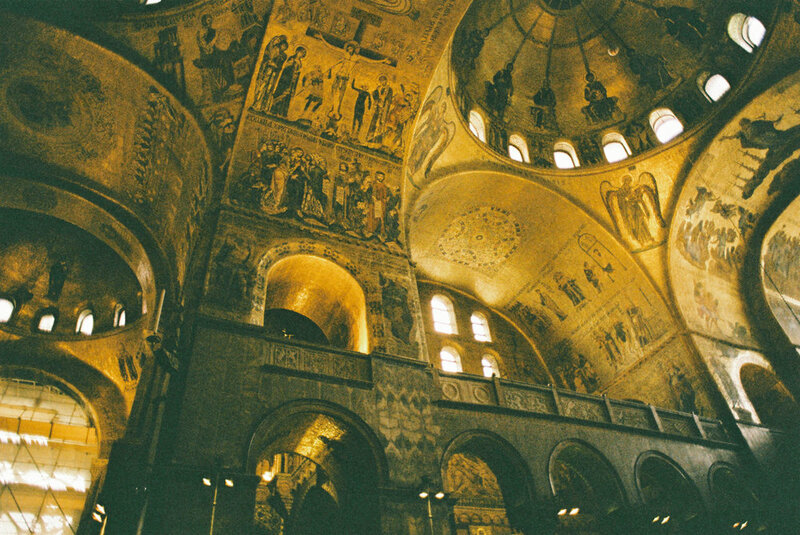 Thanks for reading my tips and tricks about Venice! It was quite an adventure, and I'm glad we made the most out of our days there. When Bo posts his photos from the trip, you'll learn a lot more about what we did and saw while we were there.